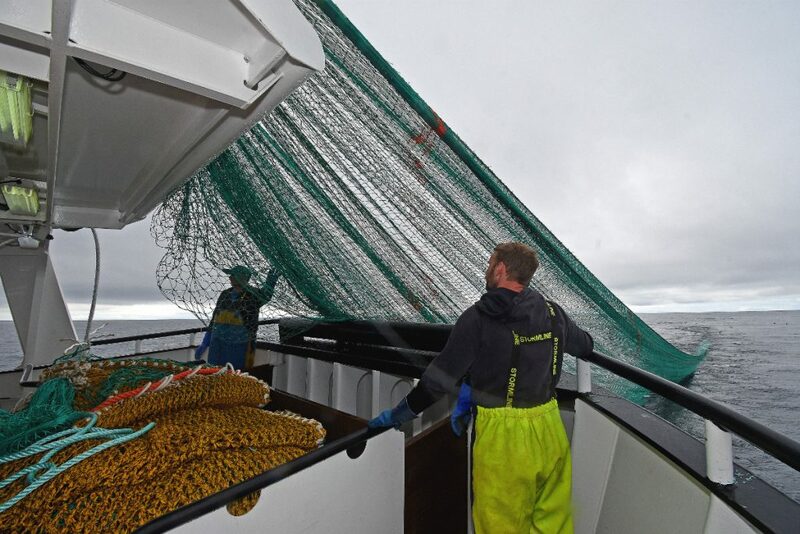 The result is a vessel custom-built to give optimum levels of economy, efficiency and safety when engaging in a finely-honed style of fishing that has stood Bruce Buchan’s family in good stead for 46 years, with two previous seine-net boats of the same name, Achieve. 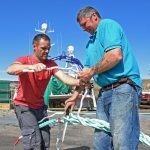 Skipper Bruce Buchan and his long-time local crew expect to fish trips of a maximum three or four days’ duration in the summer, when sailing from Fraserburgh late on a Sunday, after a weekend ashore. 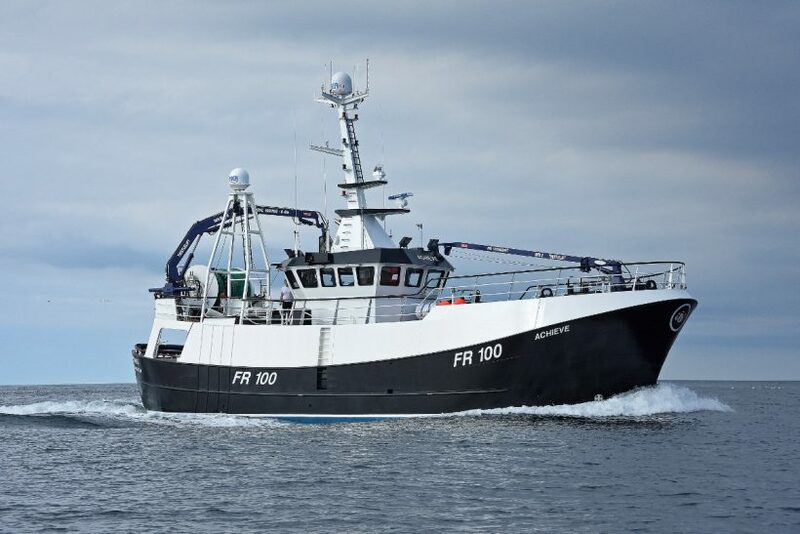 During the short winter days, when only four shots are usually possible at the seine-net, daily landings of prime-quality whitefish into either Fraserburgh or Peterhead are fairly common. Shooting away the dahn for the first time. 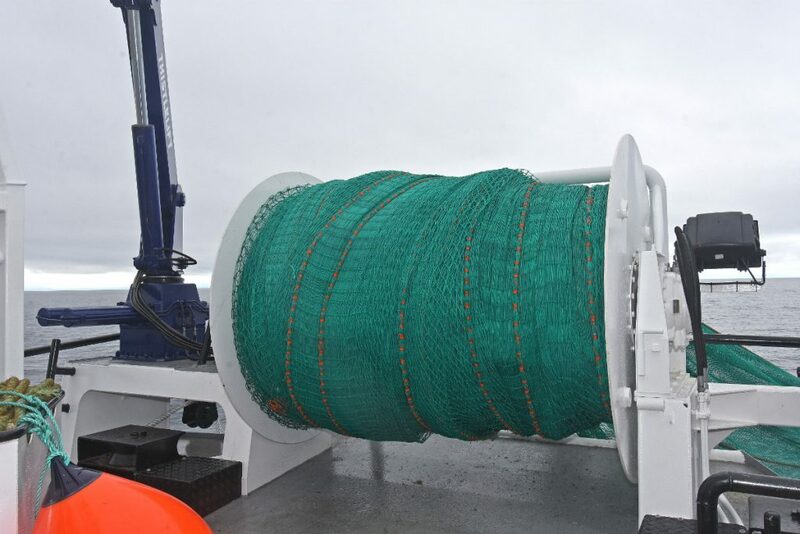 This specific style of working, in which free-running speed and working efficiency have precedence over carrying capacity, was of paramount importance when the owners started to discuss options with Macduff Ship Design Ltd, and subsequently Macduff Shipyards Ltd.
Another key consideration was how the seine-net rope would be hauled. 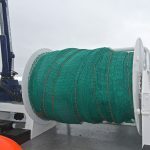 The decision was taken to opt for two large-diameter self-hauling reels that would be spooled with 30 coils of 38mm-diameter combination rope weighing some 7t. 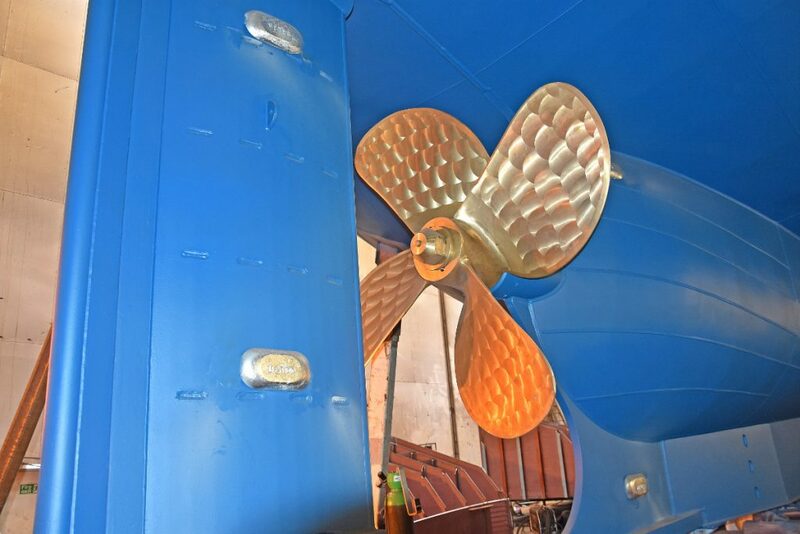 Delivering the level of stability this required, together with the required room and height forward on the main, were therefore crucial factors in the hull design. 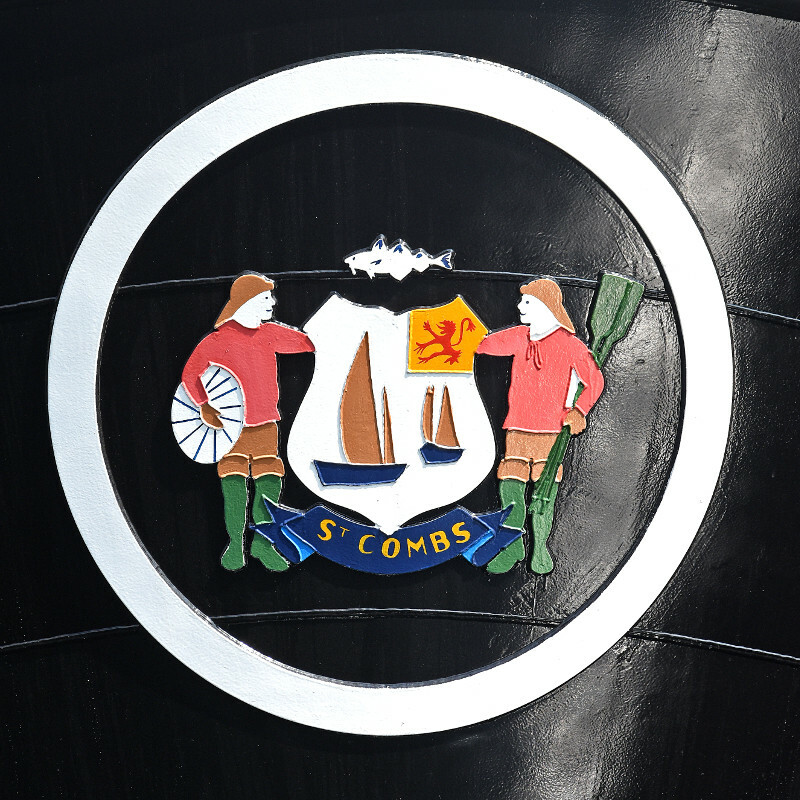 Another was the owners’ preference for a traditional cruiser stern, which has long been recognised as giving optimum levels of efficiency and safe working at the seine-net. 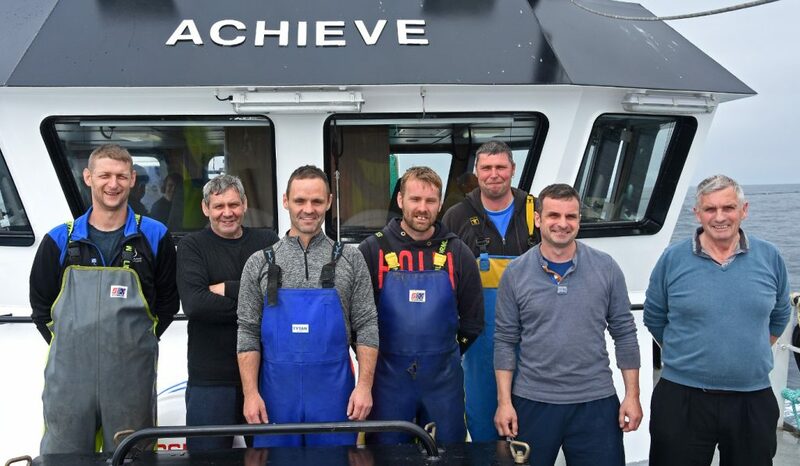 Accordingly, Achieve has the distinction of being Macduff Shipyards’ first steel hull built with a cruiser stern. 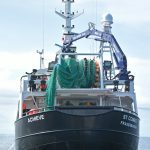 Achieve is also the first seine-netter to be built at Macduff for 33 years, when local skipper George Runcie took delivery of the wooden-hulled Ocean Challenge BF 85 (now Ocean Trust FR 152). 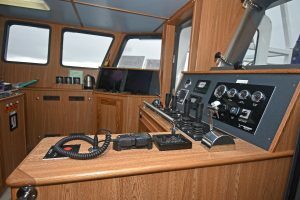 Positioning the starboard bag hatch abaft the wheelhouse, and opting for a single large eight-berth cabin, further reflect the owners’ preferences. Using the block to lift out the 12in and 14in hoppers. 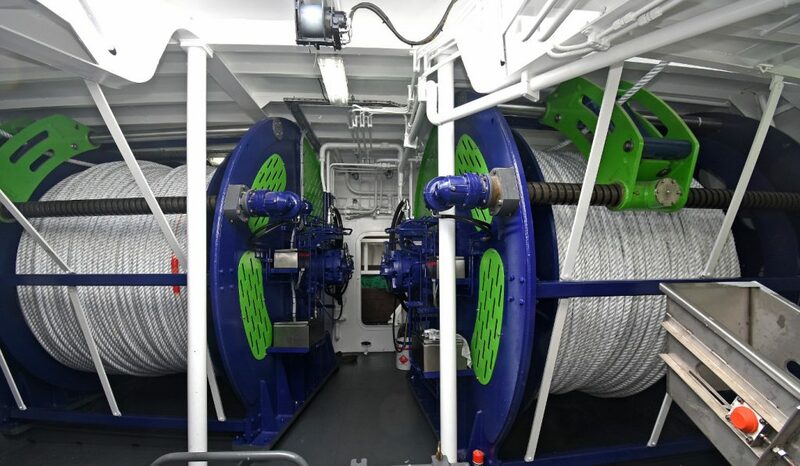 In addition to the self-hauling rope reels and a bespoke load-sensing hydraulic system designed by Thistle Marine, which operates in conjunction with a Scantrol iSym auto-seine system, modern thinking is further represented by a Caterpillar C32 ACERT main engine, an advanced catch-handling system that includes a KM gutting machine, the capability to produce 5t of flake ice per day, and two split net drums. Directly positioned one above the other at main and shelterdeck level, the net drums will bring considerable benefits in working efficiency and safety to a crew that previously shot the seine-net in the traditional manner, wing first off the quarter, before hauling it back through the block. 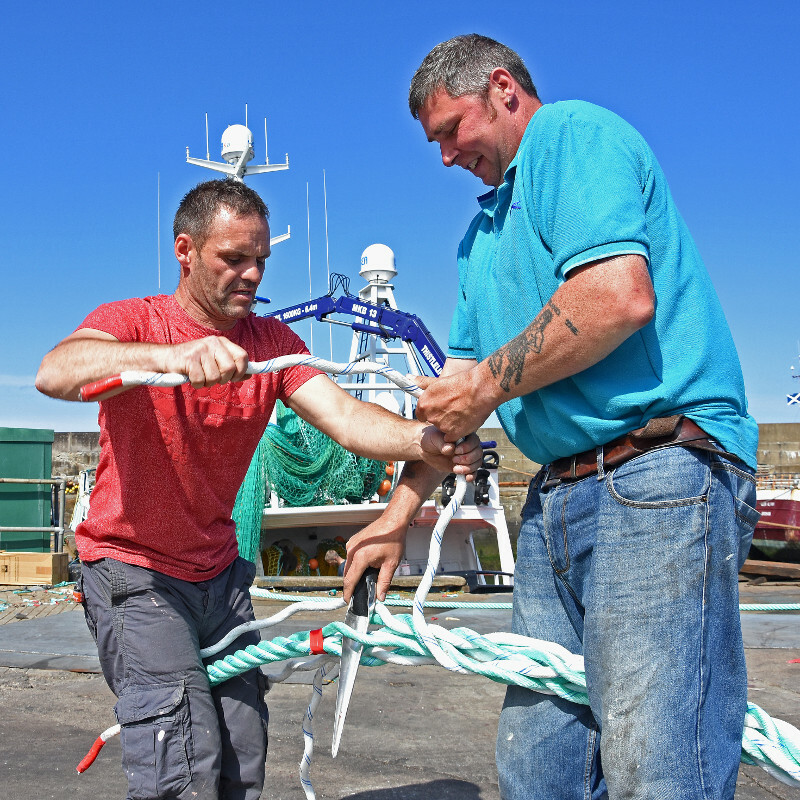 The overall result of fully-integrated working arrangements on a stylish vessel is testament to the amount of thought skipper Bruce Buchan and his highly-experienced seine-net crew of Gary Noble, John McDonald, Leigh Gavryluk, Andrew McKay and Kevin MacDonald gave to the planning of Achieve, in close liaison with the Macduff Ship Design and boatyard teams. Insured by Sunderland Marine, and working through Westward Fishing Company Ltd of Fraserburgh, Achieve was built in Macduff Shipyards’ main steel fabrication hall using a Lloyds Grade A steel kit cut by Macduff Profilers (a division of the builders) from cutting information supplied by Macduff Ship Design Ltd.
Of round bilge hull form, Achieve has main dimensions of LOA 24m, length BP 20.90m, beam 7.50m, depth moulded 4.2m, draft 4.8m and GT 224t. 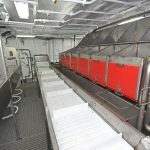 The layout throughout the vessel has been designed specifically to meet the owners’ requirements, with particular emphasis being given to maximising accessibility to all main machinery and ancillary equipment. 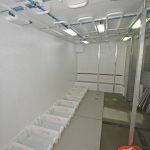 The majority of the machinery and control panels for the fishroom chilling and ice machines, supplied and installed by Premier Refrigeration, are situated in the large forepeak store. 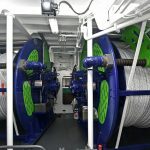 The extent to which this priority was met is probably best highlighted by the large forepeak store on the main deck forward of the self-hauling reels. 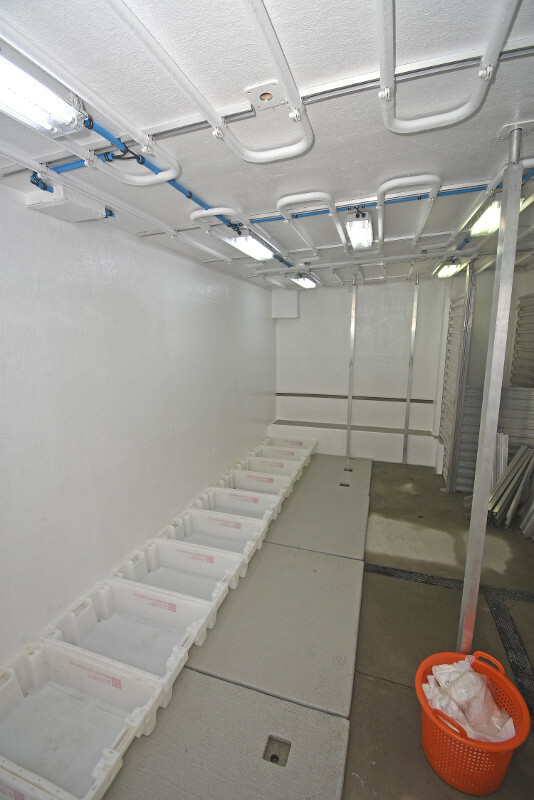 Most of the machinery for the fishroom chilling system and ice machines, supplied and installed by Premier Refrigeration of Fraserburgh, is mounted on the aft bulkhead of this compartment, rather than in the more usual location of the engineroom. 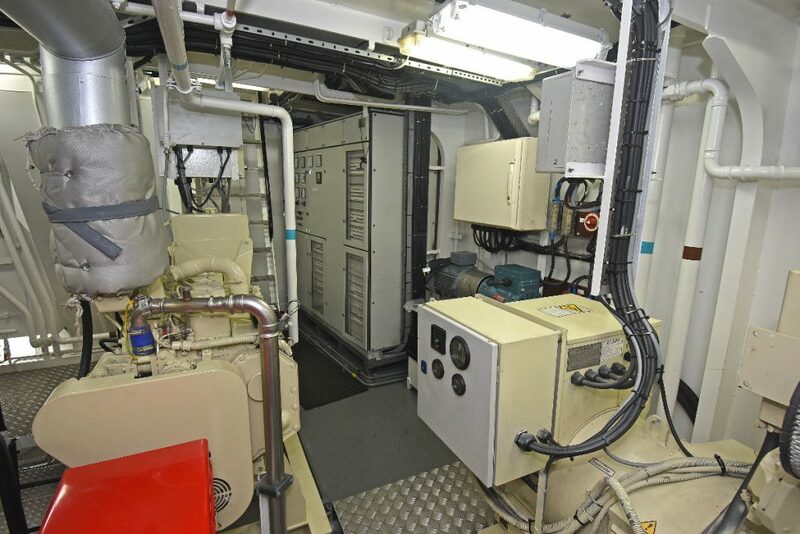 This arrangement brings the double benefit of freeing up space in the engineroom and giving maximum accessibility to the freezing compressors/condensers and control panels. 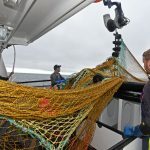 Accessible from the shelterdeck as well as off the main deck, the forepeak also houses spare netting in deep store racks positioned across the stem, forward of a chest freezer. 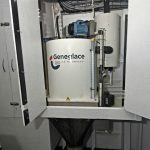 Two 2.5t Geneglace flake ice machines are housed in separate compartments on either side of the main decks, aft of the self-hauling reels positioned immediately abaft the forepeak store. 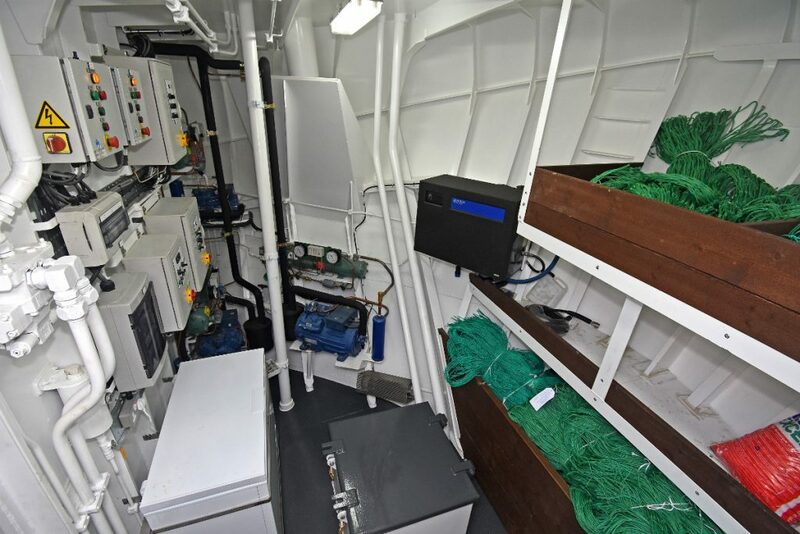 The fish-handling deck amidships is connected to the quarter by a passageway that extends the full length of the deck casing, adjacent to the portside of the hull, and includes bench seating and heated oilskin storage. 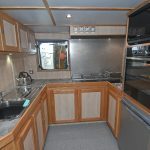 The immaculately-finished galley and messdeck are positioned along the starboard side of the deckhouse, which also includes a shower/toilet compartment. 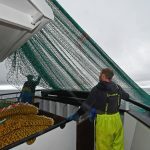 Fish are gutted and selected off the main conveyor that runs across the full beam. 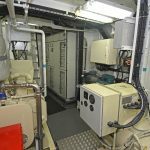 The usual range of electrical appliances installed in the deckhouse were supplied by RD Downie of Fraserburgh, which, as customary with all Macduff builds, wired Achieve and manufactured the main engineroom and wheelhouse electrical distribution cabinet boards. 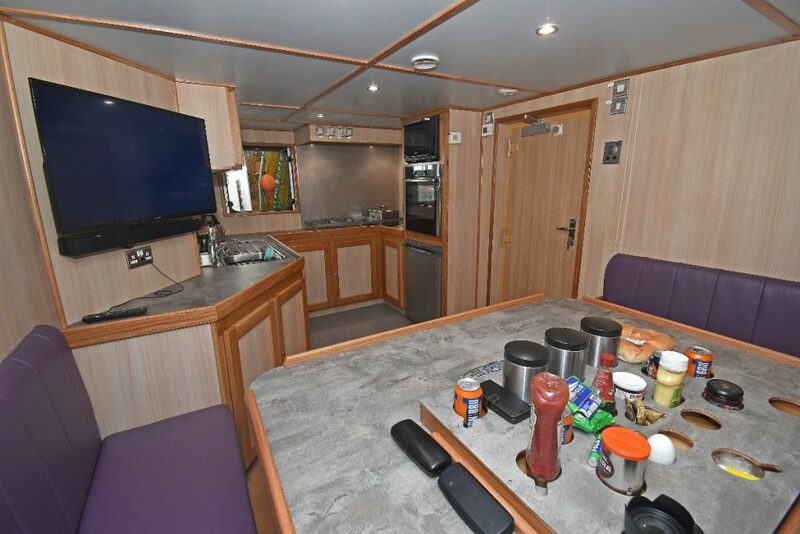 Down the aft stair, Achieve’s large open-plan eight-berth accommodation cabin provides an immediate insight into the quality of finish for which Macduff Shipyards’ joinery team is renowned. Light-coloured natural oak gives a feeling of spaciousness. 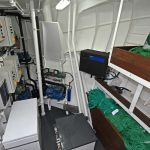 Twin levels of two beds line the hull sides, on either side of an aft compartment that gives easy access to the Scan steering gear. Eight full-height lockers over double drawers, all featuring oak-framed fielded panels, are arranged across the fore end of the cabin. 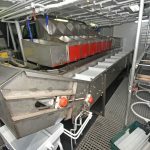 The elongated stainless steel reception hopper can hold around 250 boxes of whitefish, and is positioned between the deck casing and the starboard side of the hull. 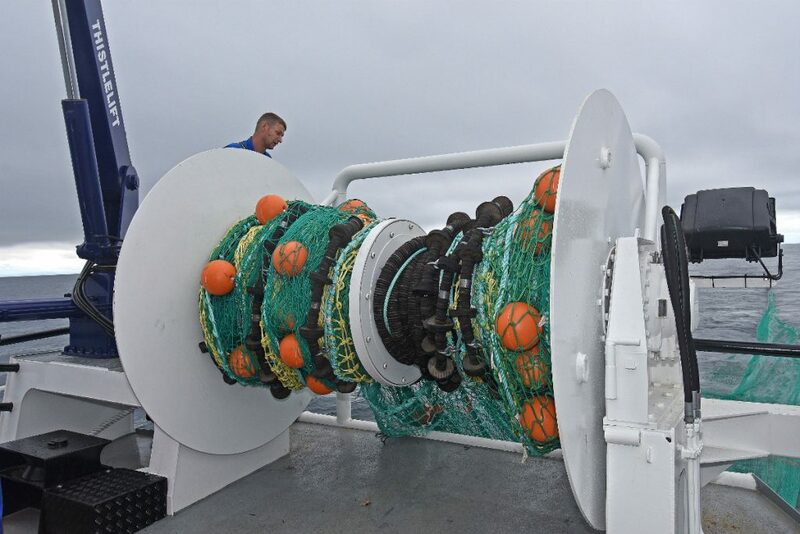 Once fish are released into it, a transverse conveyor lifts them from the base of the hopper before moving them across the full beam of the vessel. 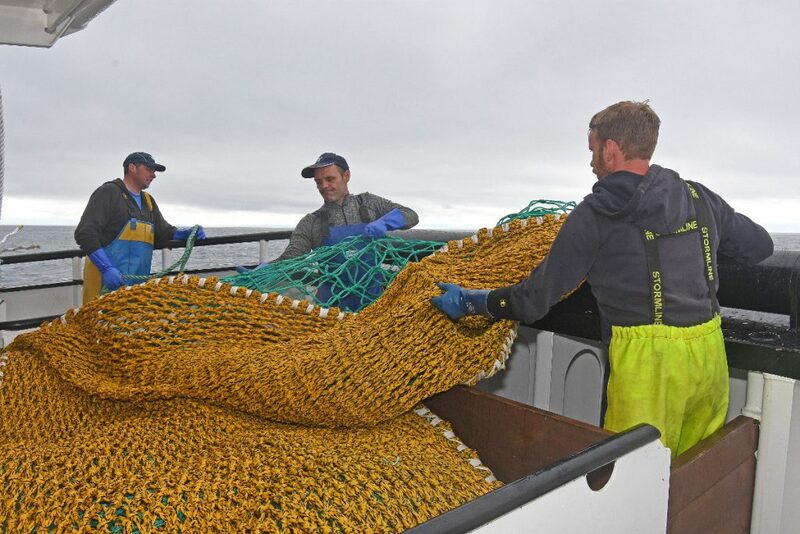 Crewmen select and gut the catch from the waist-height transverse conveyor positioned forward of the aft deck casing. 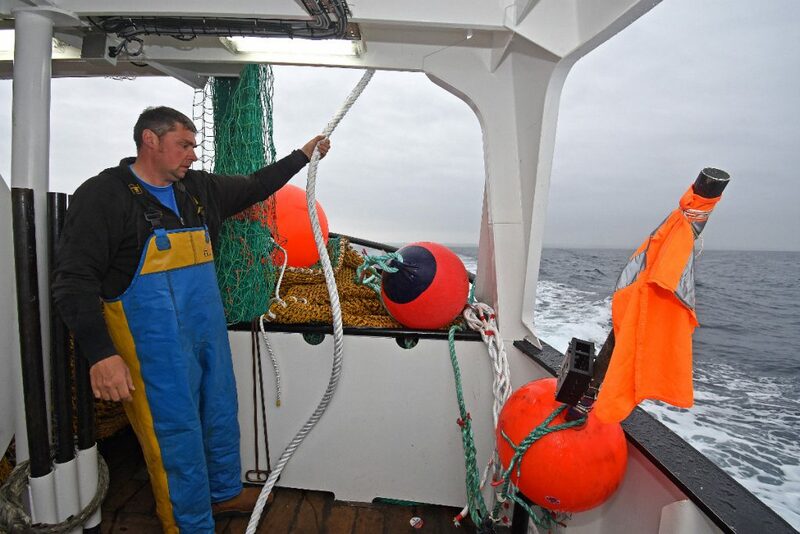 The codend hatch is positioned between the wheelhouse and net drum. 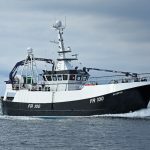 Macduff Shipyards designed and fabricated the fully-integrated aluminium and stainless steel fish-handling system, which has been designed to enhance catch quality while reducing the crew’s workload. 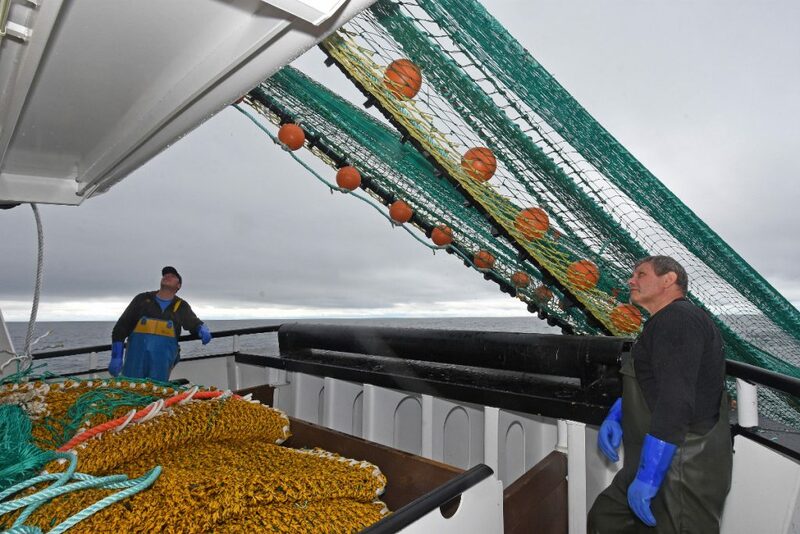 Gutted fish are placed in one of 12 selection hoppers, arranged in two tiers forward of the conveyor. Two larger single hoppers for bigger fish are located at each end of the tiered holding bins. 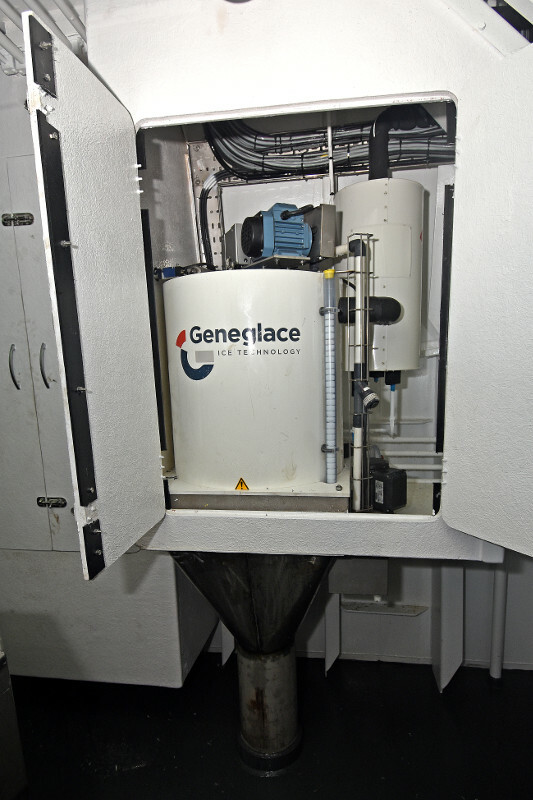 A KM5 gutting machine, supplied from a dedicated selection trough, is situated to port to accelerate the handling of smaller fish. 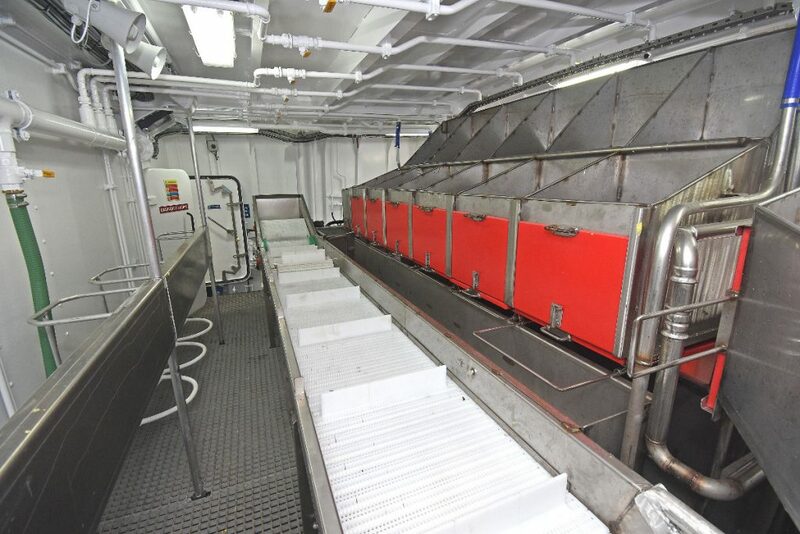 Selections of gutted fish are constantly washed by a series of overhead pipes, before the contents of a full holding bin are released into a washing system directly below the selection hoppers. 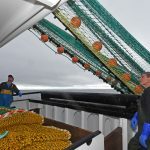 Less frequent selections of fish are placed either in baskets on deck or in elevated boxes positioned against the forward bulkhead of the deck casing. The catch-handling area is kept free of excess water from the fishwashers by two deck sumps drained by electrically driven Azcue pumps. 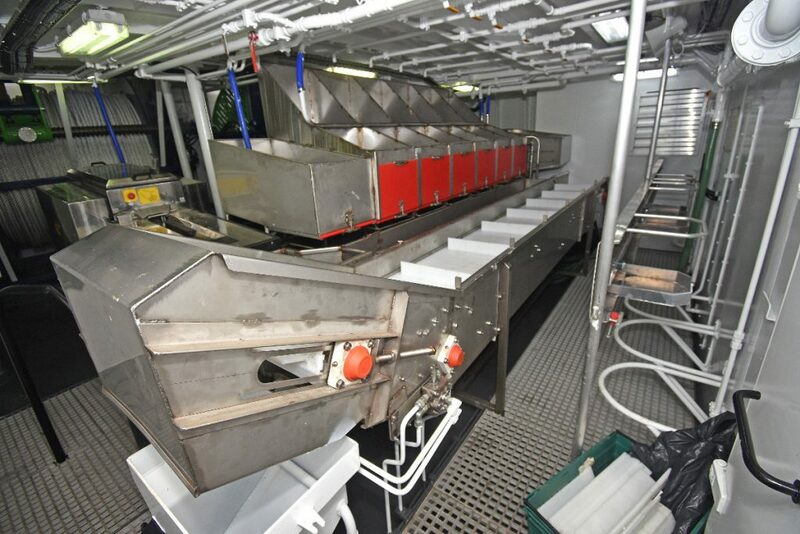 From the starboard side of the washer, fish are moved forward by a second conveyor for delivery to the fishroom. 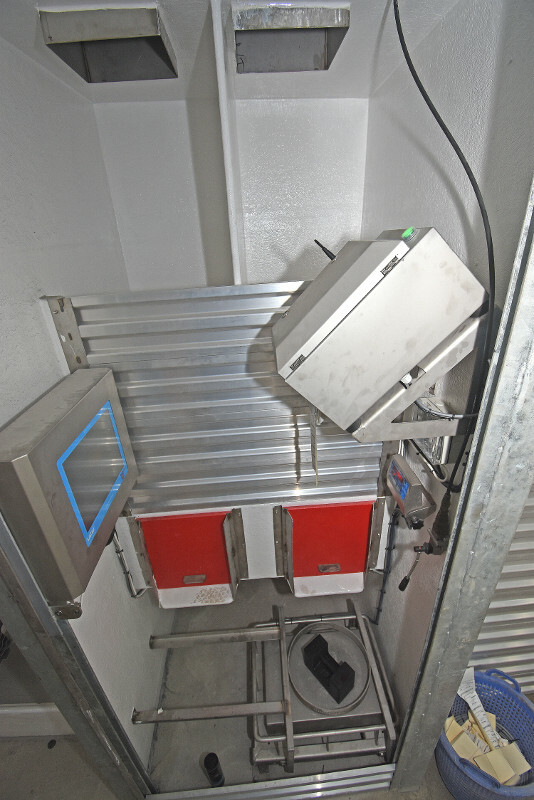 On leaving the conveyor, fish are directed by a pivoting flap at deck level to one of two holding bins in the fishroom. 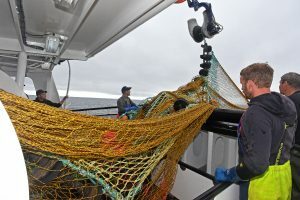 Baskets of fish are then weighed using a set of Marel electronic scales, before labels are printed off by a VCU catch-management system, from which all data is sent automatically to a computer in the wheelhouse. Achieve’s fishroom has a working capacity of 800 stacker boxes, supplied by Box Pool Solutions. 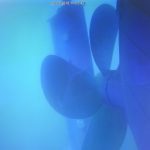 The 2,100mm-diameter open propeller and large single rudder performed well on sea trials. 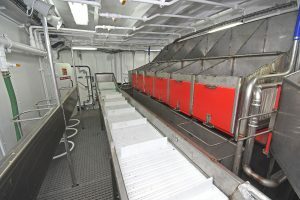 Two large ice ponds are arranged on either side of the fishroom hatch, directly under the Geneglace machines on the main deck that together deliver 5t of ice per day. 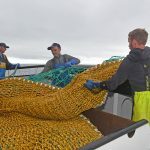 The fishroom is chilled by a conventional arrangement of 22mm-diameter stainless steel pipes on the deckhead and copper piping on the bulkheads, protected by stainless steel sheeting. 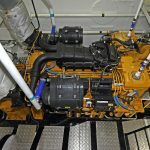 Installed by Fraserburgh specialist Premier Refrigeration, the chilling system, which is served by a Bock compressor, Blitzer seawater condenser and three-phase electric motor pumps, is automatically controlled from the wheelhouse and set to the required temperature by a digital thermostat. When landing, 12 boxes are swung ashore together using a Thistlelift landing crane mounted forward on the portside of the shelterdeck, and fitted with a 2t landing winch. 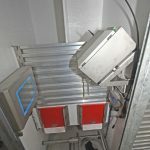 A Pullmaster winch, positioned on the foreside of the discharge hatch in the shelterdeck, is used to pull stacks of boxes forward to the hatch. 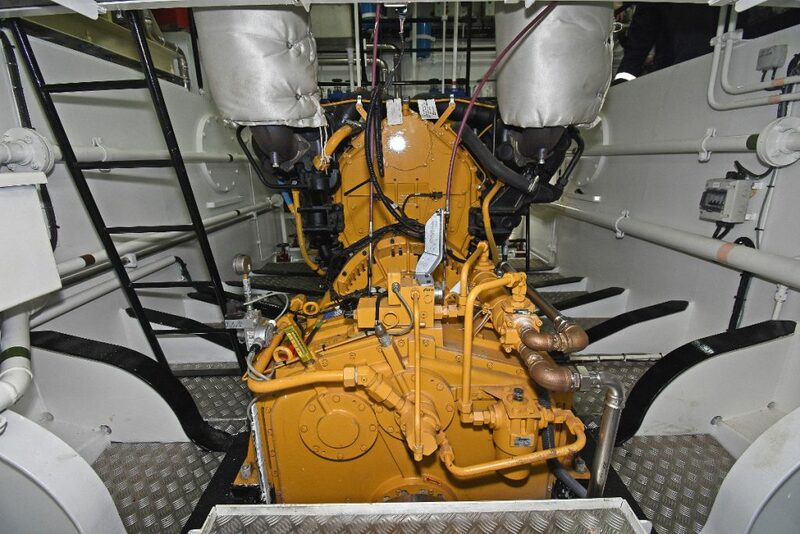 Achieve is powered by a Caterpillar C32 ACERT (Tier 3) main engine, supplied by Finning Power Systems. 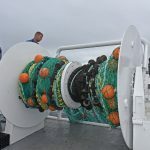 A full net retrieve system can be clutched in at the fore end of the main engine. 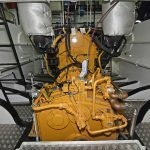 The rationale for this choice of propulsion unit lies in the fact that the electronically controlled engine, which itself delivers improved fuel efficiency, features a wide operating speed range (WOSR) to deliver a flat power curve. 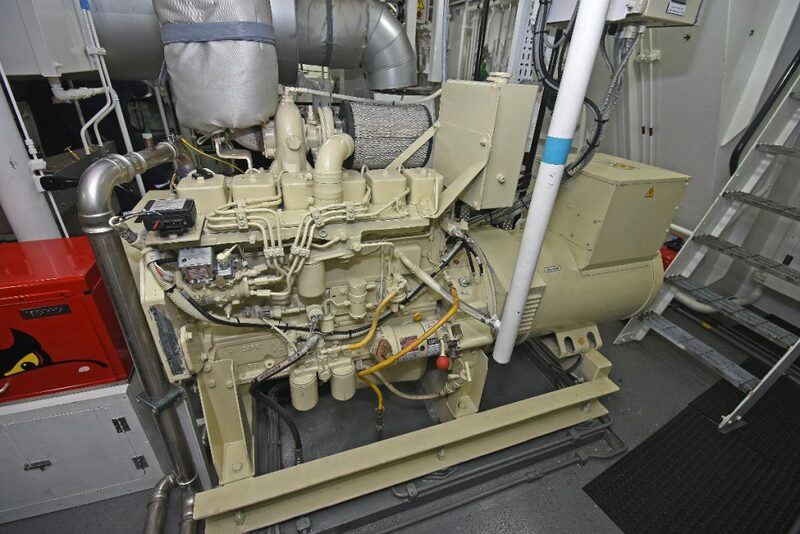 This means that the engine can deliver full power while running at 1,600rpm to 1,800rpm, thereby enabling the large propeller to turn more slowly and provide enhanced propulsion efficiency. 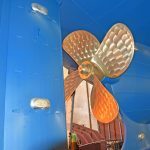 Developing 560kW and solely dedicated to propulsion duties, the main engine drives a 2,100mm-diameter four-bladed open propeller, supplied by Kort Propulsion, through a Reintjes 7.09:1 reduction gearbox. 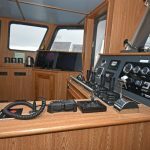 The remaining stern gear package was designed in-house by the shipyard, and manufactured by Macduff Precision Engineering on CNC machines. 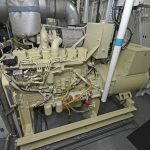 Sea trials demonstrated encouraging results with the stern gear, which is fitted with deep sea seals, delivering a very smooth and quiet performance in all operating modes. 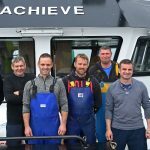 Achieve recorded an average top speed of 10.5 knots on engine trials off Macduff. 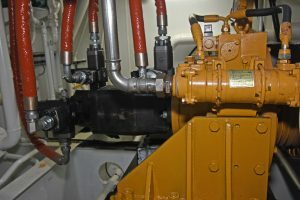 A Cummins QSL9 variable-speed auxiliary engine (260kW @ 1,800rpm) mounted on the port tank top drives the hydraulic pumps for the deck machinery through a Centra Drive. 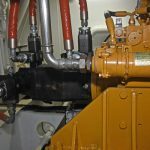 Standby hydraulic power is provided by a similar clutched retrieve pump driven off the fore end of the main engine. 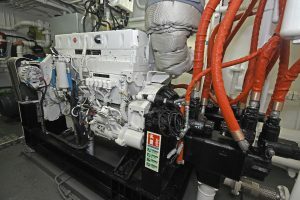 The main hydraulics are driven off the Cummins QSL9 auxiliary engine through a Centra Drive. 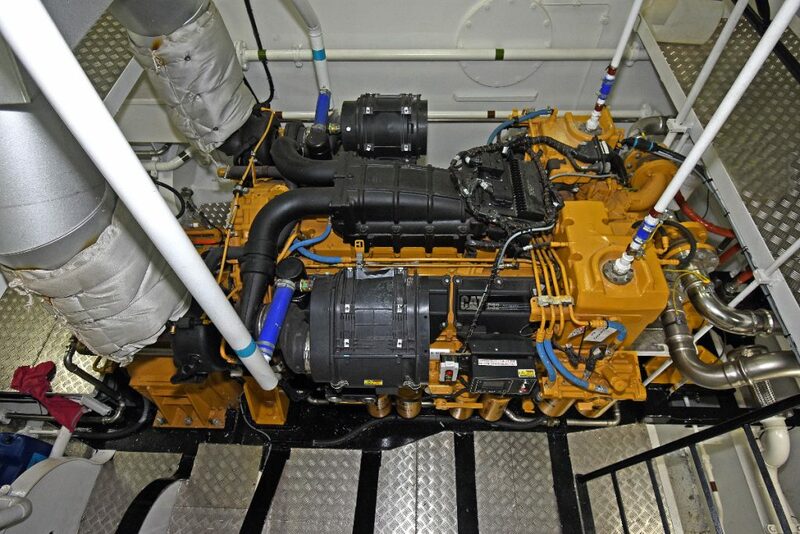 Electrical supplies onboard Achieve are provided by two Cummins 6BT5.9D2 (M) engines (86kW @ 1,500rpm) driving 81.6kW 415/3/50 Mecc Alte generators. 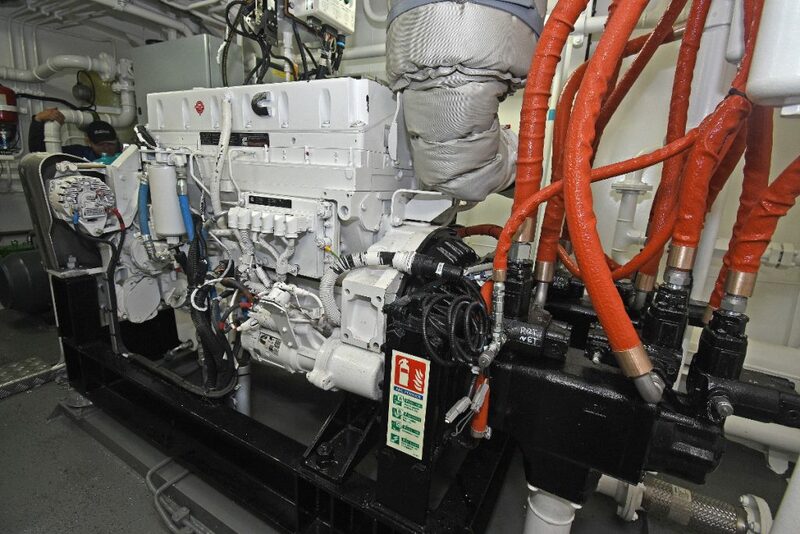 A single switchboard, supplied by RD Downie and built by Wärtsilä, allows synchronisation between both generator sets, which were supplied by Beta Marine. 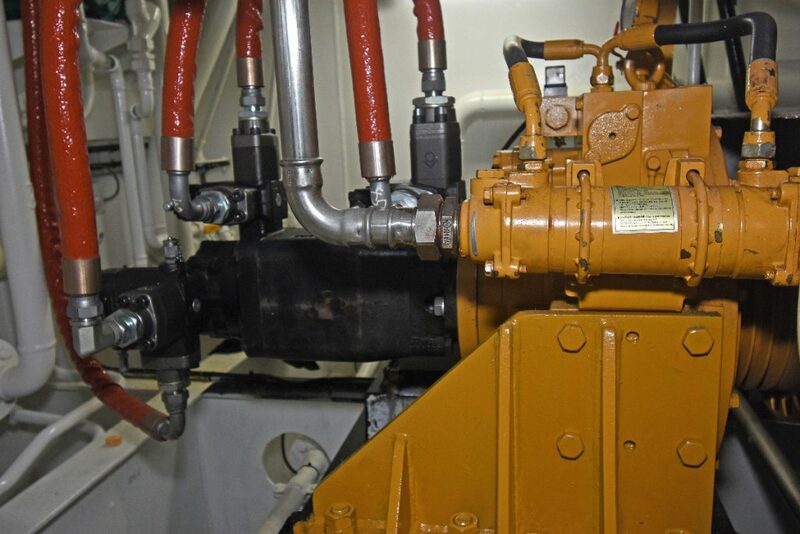 Cooling for the four engines and the hydraulics is provided through Blokland box coolers, supplied direct and arranged across the forward end of the engineroom. 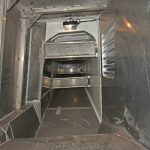 Stainless steel piping is used extensively throughout the engineroom. 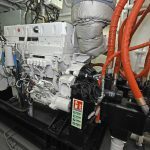 Two electrically driven 150-amp Transmotor alternators provide 24V DC supplies to the four sets of batteries fitted – one for each engine and an emergency bank. A Victron 24V battery charger and inverter is also fitted. 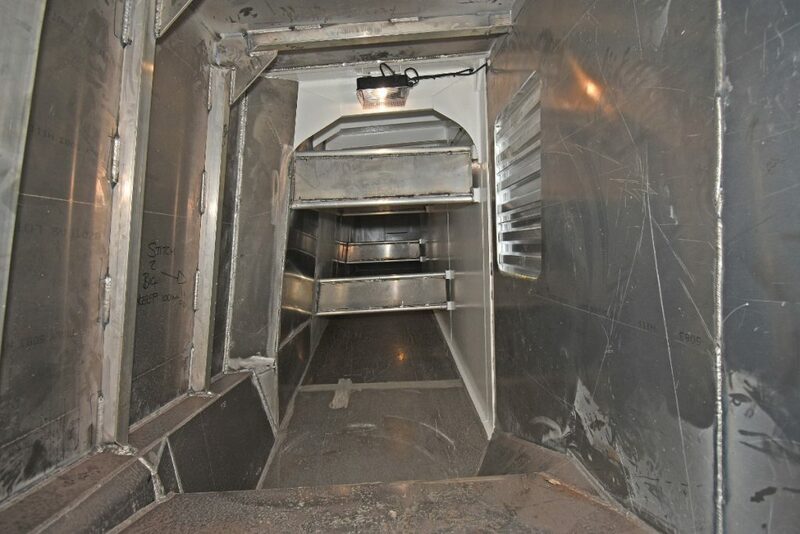 Two conventional wing tanks in the engineroom allow 22,800 litres of fuel to be carried. The bulb accommodates 10,110 litres of freshwater, and a further 8,806 litres is held in a double-bottom tank under the fishroom. A 112kW hydraulic bow thruster, supplied by Hardy Engineering, is fitted to give Achieve enhanced manoeuvrability when operating in restricted spaces. 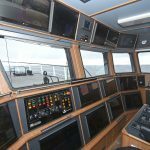 Woodsons of Aberdeen and Furuno UK supplied and commissioned the comprehensive array of top-end electronics equipment fitted in Achieve’s wheelhouse. Achieve’s main forward and overhead consoles. 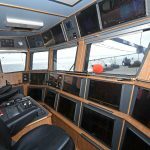 A combination of 21 24in and 19in Neovo X-Series flat screens are flush-mounted in the main and overhead forward consoles, and aft at the central fishing console. 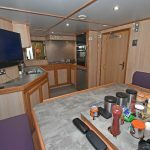 As in the other internal areas, light oak is used to good effect in the wheelhouse, giving an equally high standard of finish, which is matched by similarly-coloured wood-effect flooring. 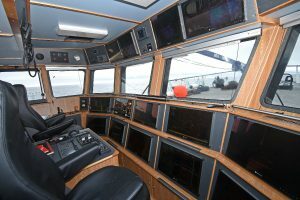 Two NorSap helmsmen’s seats flank a central console containing the Navitron NT921 MKII autopilot unit and radar controls. 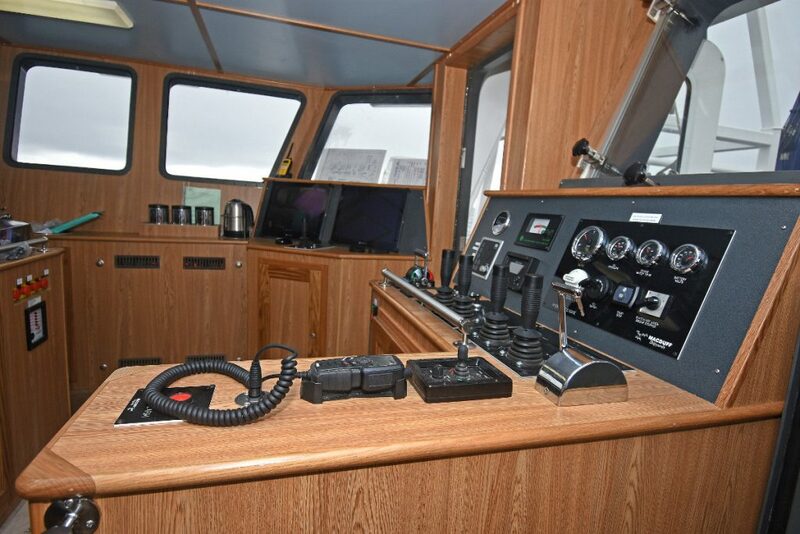 Slim wing consoles, on which two sets of Helmsmen System engine controls and jog steering levers are mounted, are positioned at each end of the full-width double-tier console. The fishing console is positioned between the deck casing trap to port and the exit door to starboard. 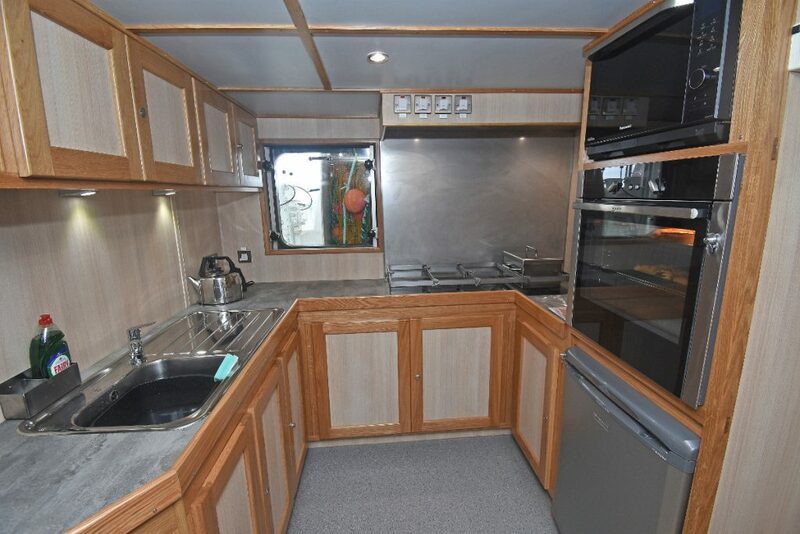 A small sink and hot drink-making facilities are available on the starboard side, and a small desk area to port. Fish-finding duties are performed by Simrad ES80 and Kaijo KSE300 split-beam 38kHz echosounders. 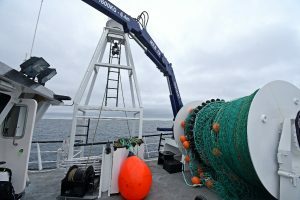 The 16-beam Kaijo sounder gives fish size and count, in addition to extremely good detection when fish are tight to the bottom. The radar platforms are splayed on the aft mast. 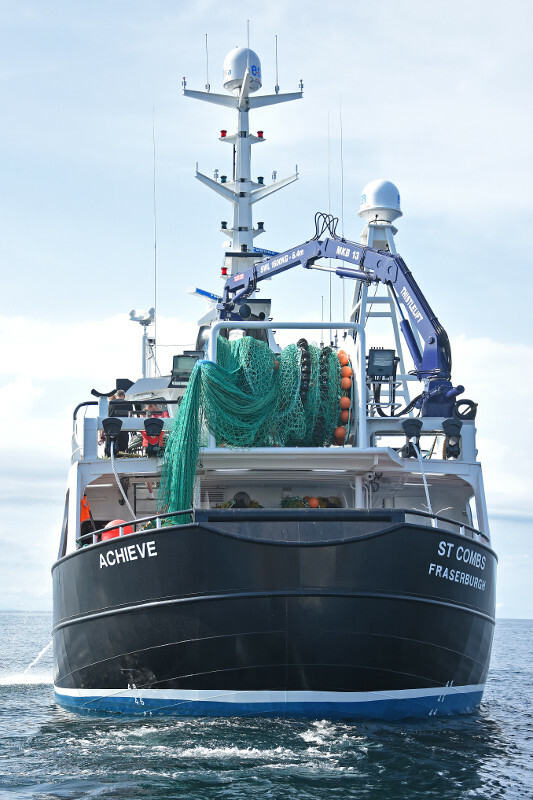 Achieve’s advanced radar sets came from Furuno UK of Fraserburgh. 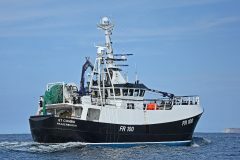 Capable of plotting up to 100 targets and displaying up to 1,000 targets, the FAR 2827 main unit is said to be the world’s bestselling 25kW commercial radar. The hi-speed 1518-BB radar, which incorporates AIS/ARPA connectivity, provides fast target-tracking and advanced capabilities, including CPA/TCPA, customisable warning function (closest point to approach of target and time), and Guardzone function. The radar platforms, positioned towards the base of the fabricated aluminium communications mast, are splayed to port and starboard to maximise performance and give a stylish appearance. 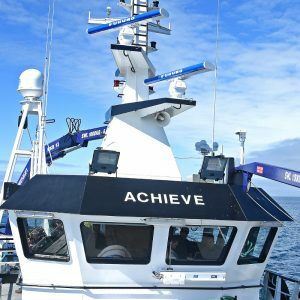 Details of Achieve’s location are processed by two Furuno GP 39 GPS navigators, and vessel heading is provided by a JRC JLT 21 satellite compass. 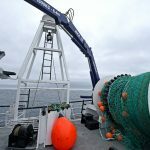 Positioning data received is interfaced to two Sodena Easywin plotting systems c/w hi-res seafloor charts, AIS and ARPA. 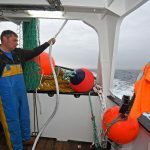 A FishSafe unit is also fitted. 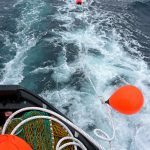 Communications and safety equipment includes JRC JSS-2150 150W 6310 GMDSS MF/HF radio telephone, Sailor and Entel VHFs, Jotron TR-8000 Class A AIS, Jotron TRON 60GPS e-Sea 60 Ka-band internet communication, and e-Sea 60 satellite TV systems. 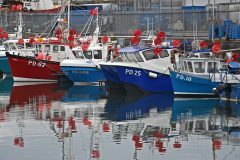 Woodsons also installed an extensive CCTV system, in which 16 cameras provide comprehensive coverage of working activity and vessel positioning to give optimum levels of safety at all times. 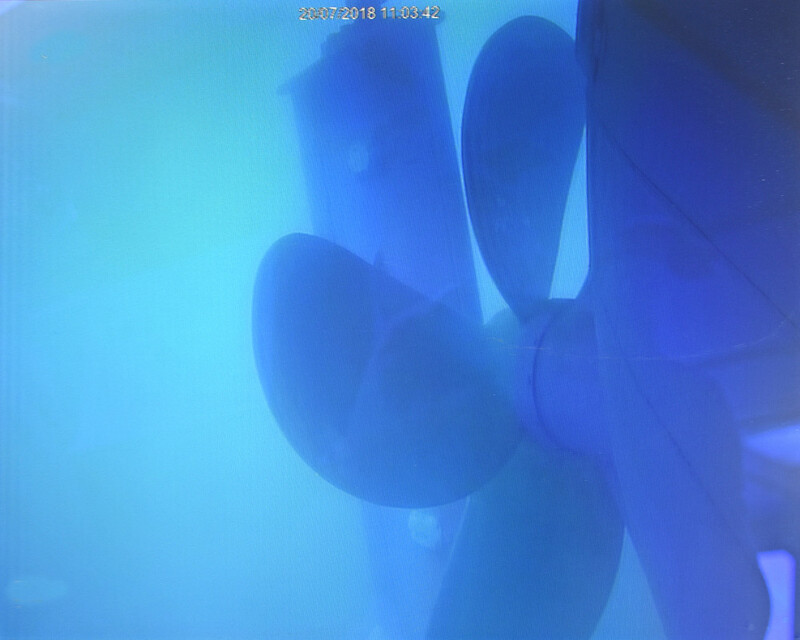 An underwater video camera mounted on the hull provides continual coverage of the propeller and large single-flap rudder, which returned high levels of manoeuvrability on trials off Macduff. 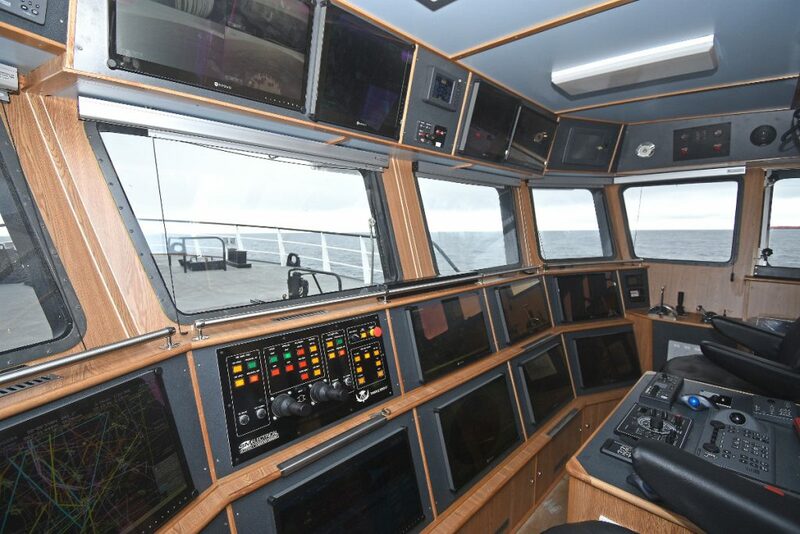 Two cameras located on top of the aft mast give commanding views of the fore and after decks, and the immediate area ahead and astern of Achieve. 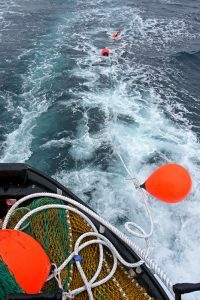 Further assistance for the skipper in judging distances when manoeuvring Achieve in restricted areas comes from two stem-mounted cameras looking directly downwards towards the bulbous bow.